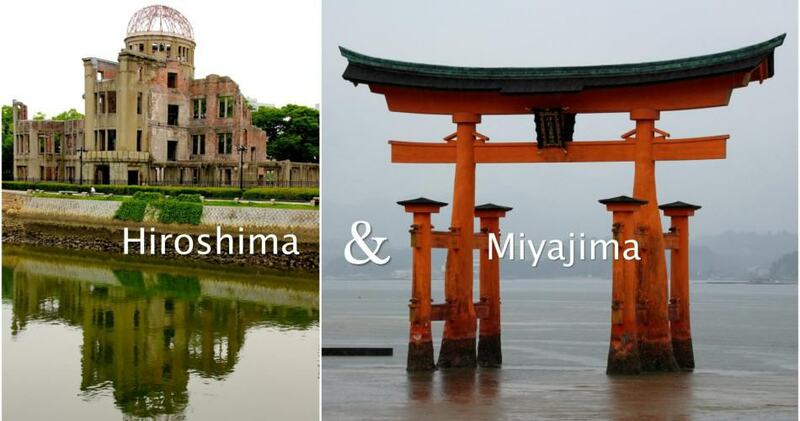 On our final day in Japan, we visited Hiroshima and Miyajima. 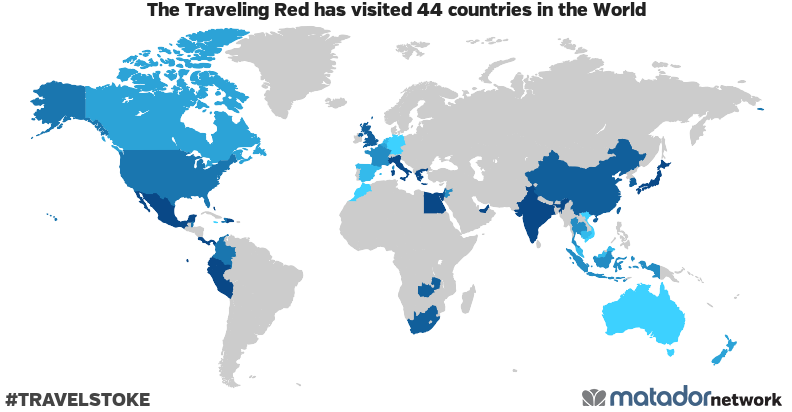 You can visit these places rather quickly and fit them both into one day (since they’re in the same direction) if you’re well prepared. Efficiency is key for a successful side trip, especially for an extra long day like this one. Have your day mapped out, know what you want to see, and exactly how to get to it. You can’t waste much time. I also suggest speaking to the concierge at your hotel before. They can usually provide maps, train timetables and help you create an itinerary for that day. 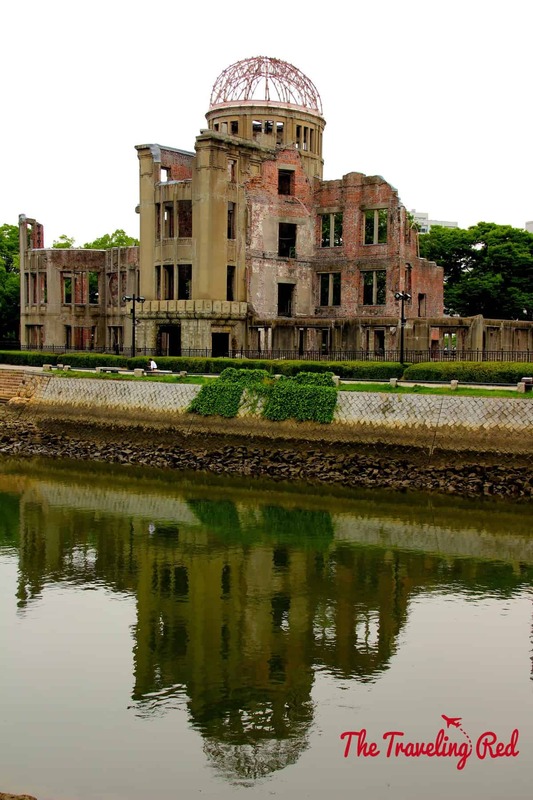 We got an early start on the day and caught the train for a 2-hour ride to Hiroshima. Everything we wanted to see was in the Peace Memorial Park so we took a taxi right from the train station to the park. 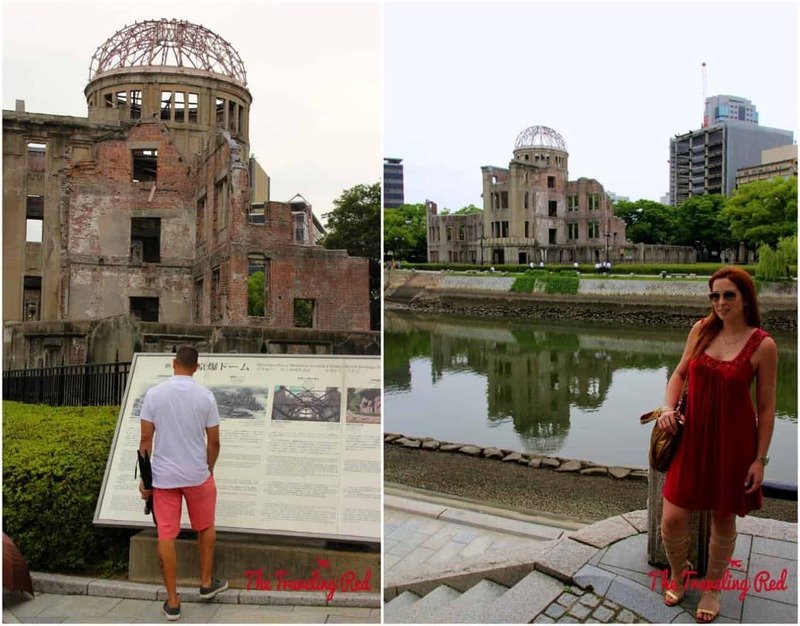 First we stopped at the Atomic Bomb Dome (also known as the Genbaku Dome). 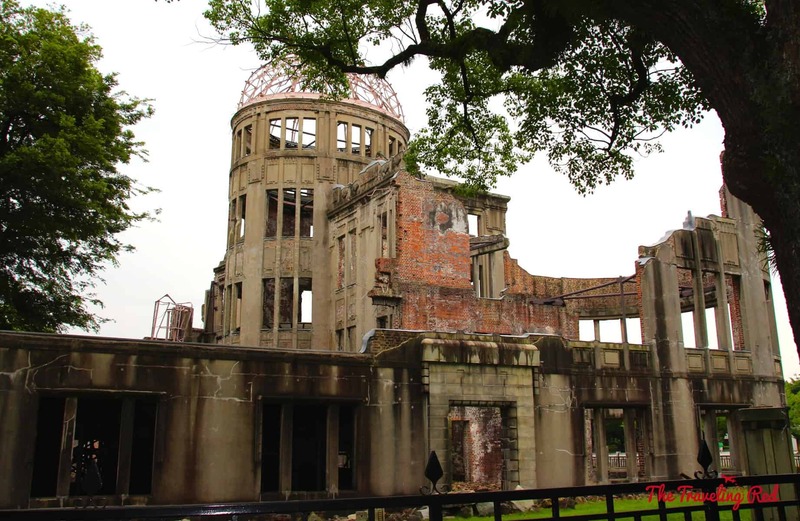 This is the only building still standing after the detonation of the first ever atomic bomb used in a time of war. The detonation was almost directly overhead, which is why this building didn’t crumble. 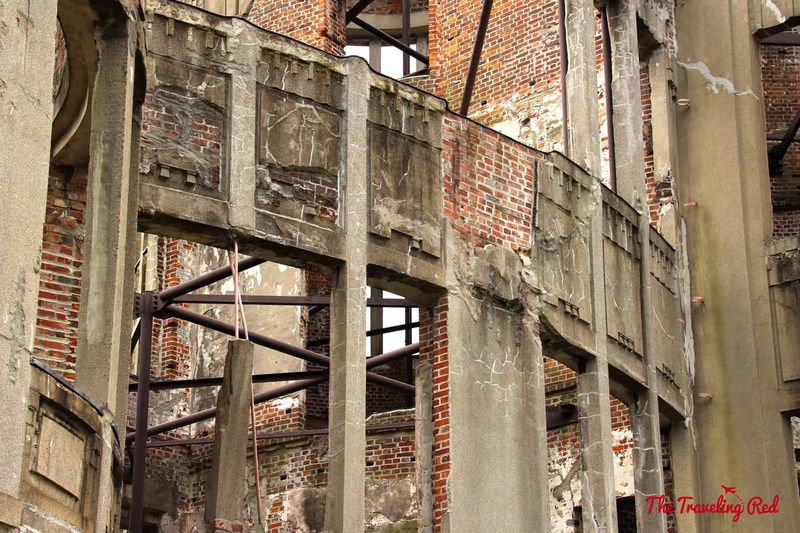 Vertical structures are the strongest, allowing this building to withstand the blast, even though everyone inside died instantly. It was so moving to see this structure still standing, but completely destroyed, from such a significant moment in history. 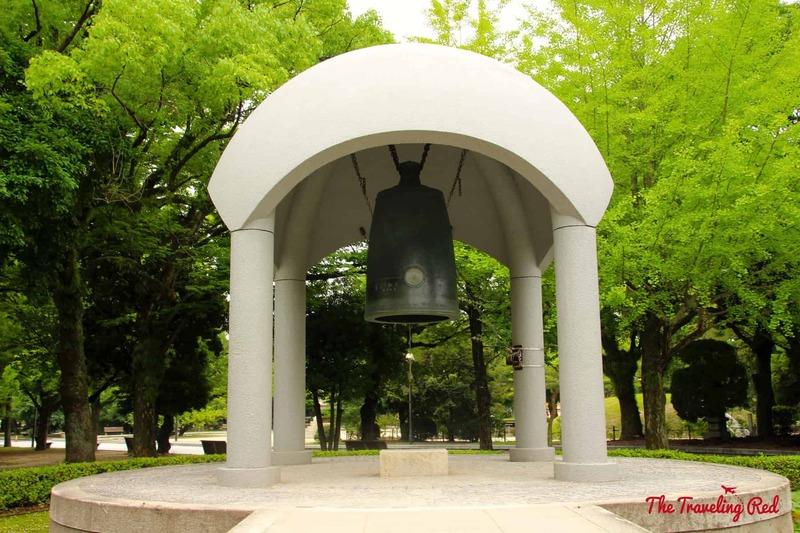 We then walked around the park to see the Children’s Peace Monument and the Peace Bell. 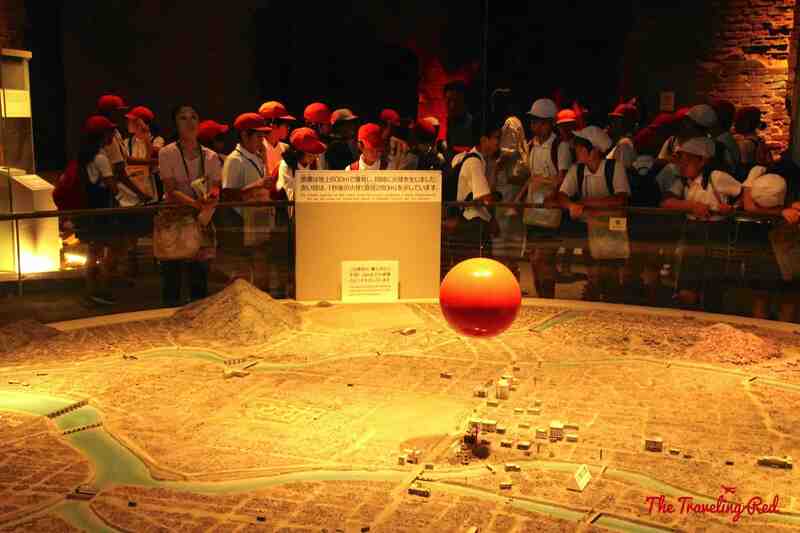 I was so impressed by how the people of Hiroshima focus on the positive instead of the negative. Everything in the park was focused on peace and moving forward. 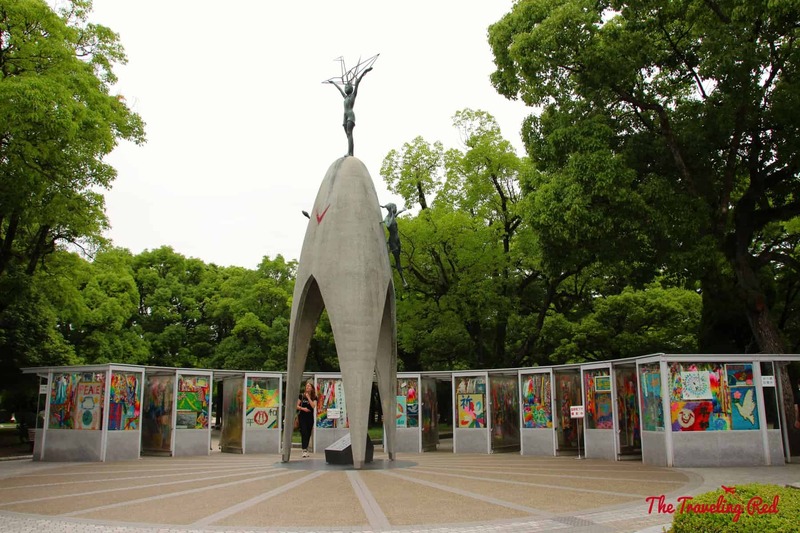 Finally, we went to visit the Hiroshima Peace Memorial Museum, which is at the other end of the park. 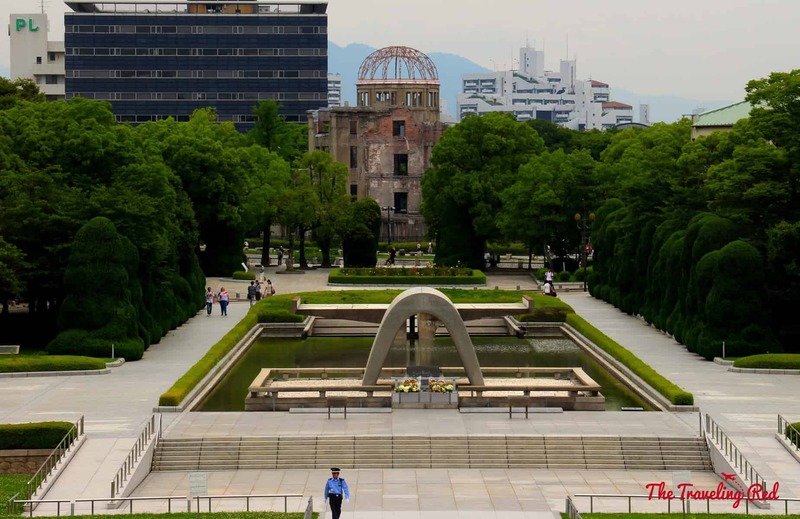 From the Pond of Peace, in front of the museum, you can see the A-Bomb Dome. 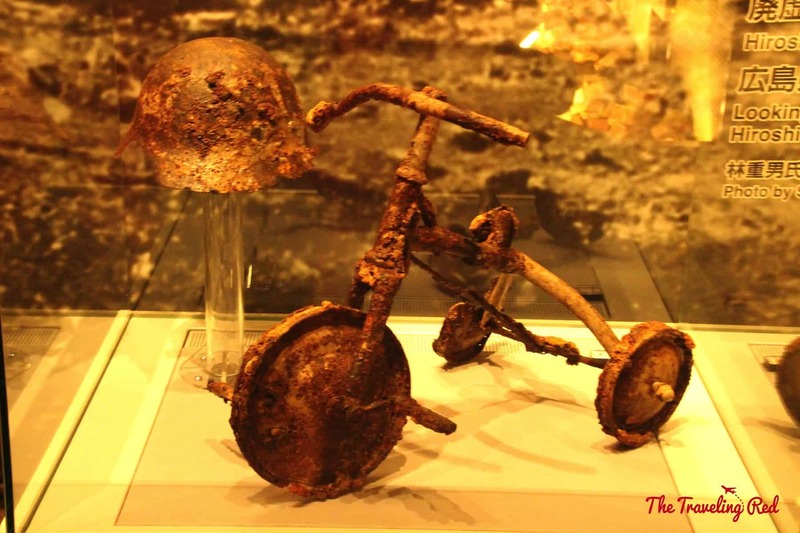 Once inside the museum, we saw a lot of pictures and artifacts from the explosion, like the toddler’s tricycle and helmet (pictured below). 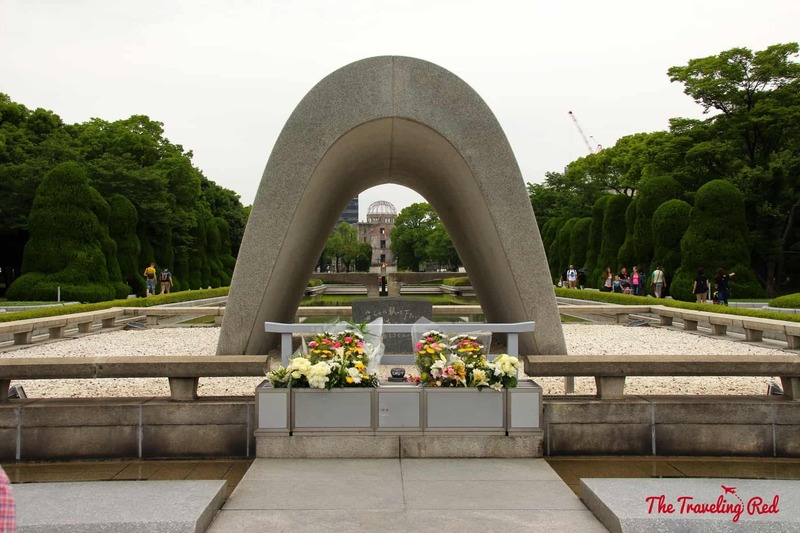 It was so sad to see what happened on that day in August of 1945. If you plan to visit the museum, pack some tissues; you’re going to cry. 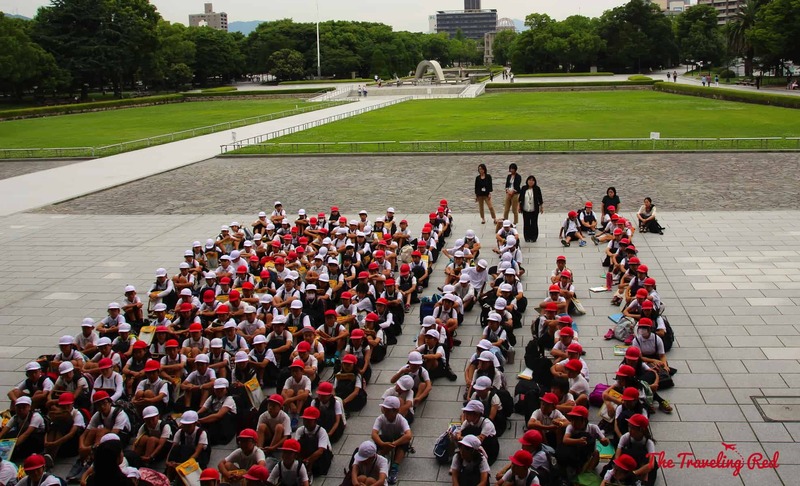 The museum was full of children; clearly a popular place for school field trips. Below you’ll see them sitting outside of the museum after their visit. I loved their matching hats. After seeing the main things in Hiroshima, it was time to continue on, but not before stopping at our favorite ramen chain, Tenkaippin, for a quick lunch. On a super random side note, how great are these baby seats in the bathrooms? 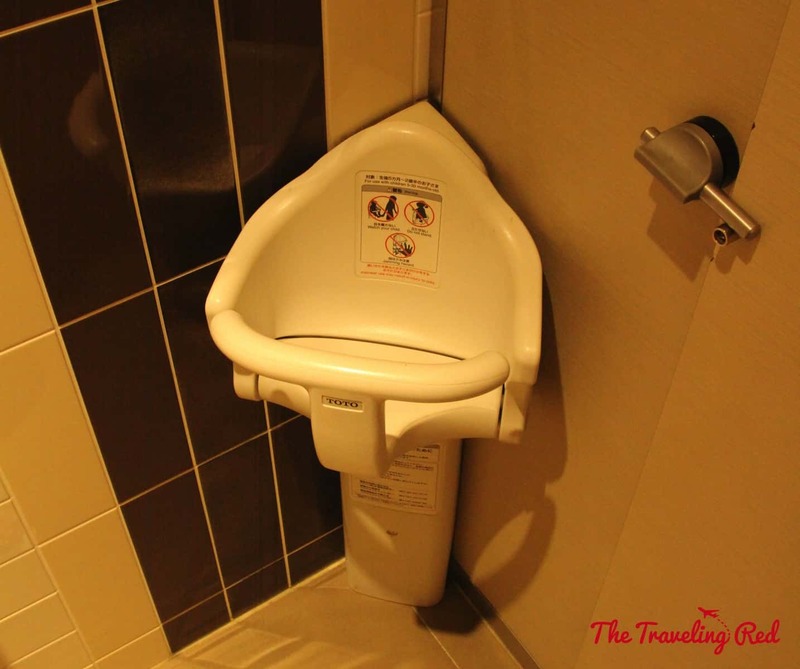 Not only does Japan have smart toilets EVERYWHERE (even in public restrooms), they also have these baby seats in the women’s restroom so mommy’s don’t struggle. 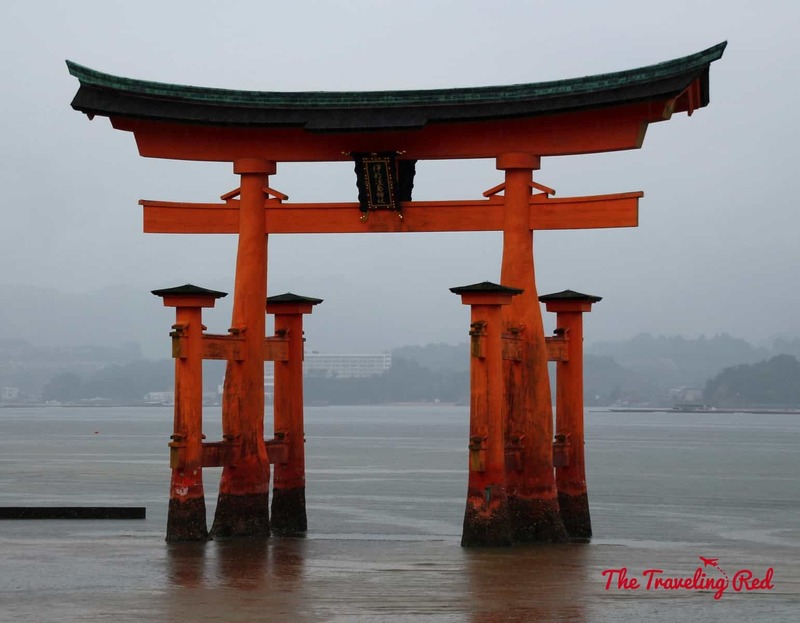 We then got back on the train and headed to Miyajima to see the Itsukushima Shrine. This torii welcomes you as you approach the island on the ferry. After the train ride, you must take a ferry to the island. But don’t worry, it’s included with your Japan Rail Pass. I told you it was worth buying! Luck was not on our side and it was storming. Going up to Mt. Misen to see the beautiful view of Japan was no longer an option. To add to our bad luck, it was low tide, so the torii was practically out of the water. But, we got to see it. Soaking wet and exhausted, we headed back to Kyoto (it’s about a 3-hour ride). Make sure you check the train timetable when you’re planning your side trips. NEVER plan on taking the last train back. At the very least, pick the one prior, so that if anything goes wrong (making you late) you still have an option. It would be horrible to be stuck in another city without any of your things, especially when you already paid for the room night elsewhere. We finally made it back to Kyoto for a warm shower, room service dinner, and just in time to pack our bags and get a few hours of sleep before heading to the airport. Our summer vacation then continued in South Korea. get pleasant information from here every single day. the last part 🙂 I look after such information much. must say that you’ve done a great job using this type of. Additionally, the blog loads very fast for me personally on Opera. Hello there, You’ve performed an excellent job. I will certainly digg it and in my view suggest to my friends. Your look is really unique as compared to other folks I’ve read stuff from. I appreciate you for posting about your experience, I’ll bookmark this page.